Yeah, but: I'm admiring its vintage feel. The Long Version: Certain things are so ugly that they're attractive. This is an understandable evolutionary advantage, as anyone who has seen a newborn baby can attest, but product designers and pug-dog breeders also put it to good use. 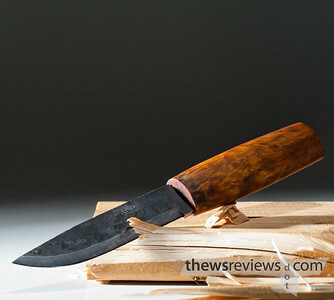 And since I try to acknowledge good design, Helle deserves my congratulations: Volvo's been trying to make the the ugly-appeal thing work for years, but the Norwegian knife maker nailed it on the first try. To be fair, the current Helle Viking is actually their second knife of this type; the first had a blade that was slightly shorter. 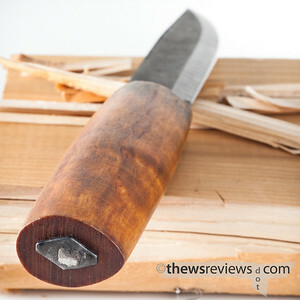 It's based on a design that's literally over a thousand years old, and the same basic knife is still commonly known as a "Puukko" or "Pukko" today. But a word of warning: 'Puuko' is something very, very different. The Viking has an old pattern but modern steel; it's a three-layer carbon blade that has just faintly-visible lamination lines. Compared to my Spyderco Caly3, the result is so subtle that I found myself wondering if I'd bought a new single-steel model instead. And no, I can't believe I just called anything about the Viking "subtle". The Viking's blade is half a centimetre, three-sixteenths of an inch, thick. For an 11cm-long blade that's absolutely massive, and the Scandinavian single-bevel sharpening gives it a tremendous moral authority that's emphasized by not polishing off the black heat-treatment scale. This remains slightly rough, and is simply stamped "Helle" while most of their knives also have a model name on the blade. The construction of the Helle Viking is fairly simple. It's a straight blade grind – mine is slightly off-centre – with a short choil and no guard or bolster. The thin tang passes through the one-piece wood handle and is fixed in place by being peened over the large diamond-shaped washer. 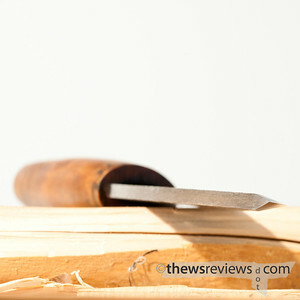 The handle has a subtle teardrop cross-section and a lingering smell of linseed oil. The result is basic and comfortable to hold. My first reaction to the knife was to be bothered by the lack of any guard, and I considered a half-dozen other Helle models before dragging myself out of the store. But over lunch, and with some subtle support from a couple of friends, I picked the Viking as the knife to own. Now that I have it, I'm really not sure what the problem was. This isn't a knife that's designed for stabbing, which is a pretty useless thing to use a knife for, but otherwise the handle has plenty of grip. It wouldn't be my choice to use with ski gloves, but if it's cold enough to need gloves that heavy, I'm not likely to be outside. 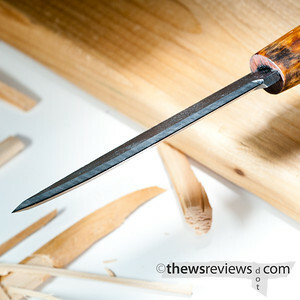 While the brand-new Viking doesn't really seem very sharp to the thumb-test, it still cuts tremendously. I was tempted to resharpen it as soon as I brought it home, but I'm glad that I didn't bother. The Viking had no problem going through a dozen layers of the nylon banding that's used to secure shipping pallets, and while its thickness makes it tough to slice down cardboard boxes, it feels like a good choice for felling a small tree. The very dry western red cedar that I disassembled for these photos may be the woodland equivalent of styrofoam, but the knife handled it with ease. My only disappointment was that the thickness of the blade, and the steepness of the grind, made it hard to stick into the wood the way I wanted it to. I eventually resorted to hitting it with a hammer, with only limited success. I've idly wanted a good fix-blade utility knife for a very long time; when I was a kid I'd read the Cold Steel catalog and longed for the SRK. But the fact that their Bushman has been sitting in my toolbox, waiting to be sharpened, for more than a decade speaks to just how little I need one. I do also have a short fixed-blade utility knife for tasks that don't suit a folder or a box-cutter, but it doesn't see much use, either. So I have to concede that the Viking is something of an art piece for me. It's functional art, to be sure, but my non-camping downtown-condo-living lifestyle means that it's largely a desk toy and will never be called on to earn its keep. Regardless, the laminated carbon blade makes for an unusual knife that's a very satisfying thing to own, and it could be genuinely useful for something someday. 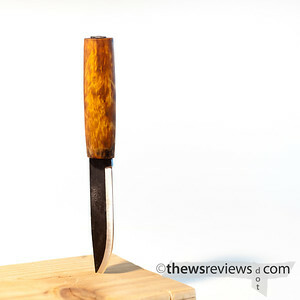 Until then I'll just make sure that it's handy, with only the occasional glance at the rest of the Helle website. Wow, that's really L'Anse aux Meadows era technology. I like. The "country" compliment to the "city" Opinel.